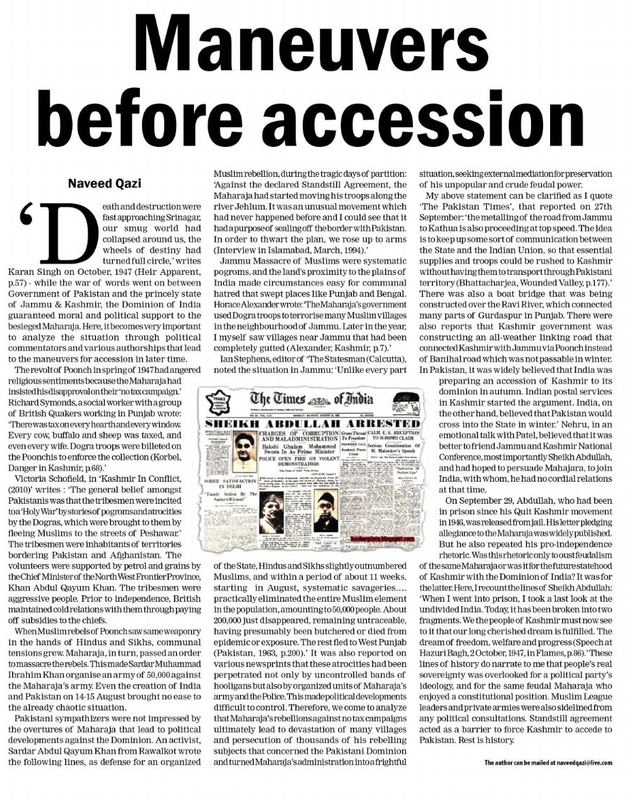 ‘Death and destruction were fast approaching Srinagar, our smug world had collapsed around us, the wheels of destiny had turned full circle,’ writes Karan Singh on October, 1947 (Heir Apparent, p.57) - while the war of words went on between Government of Pakistan and princely state of Jammu & Kashmir, the dominion of India guaranteed moral and political support to the besieged Maharaja. Here, it becomes very important to analyse the situation through political commentators that lead to the maneuvers for accession in later time. Victoria Schofield, in ‘Kashmir In Conflict, (2010)’ writes : ‘The general belief amongst Pakistanis was that the tribesmen were incited to a ‘Holy War’ by stories of pogroms and atrocities by the Dogras, which were brought to them by fleeing Muslims to the streets of Peshawar.’ Tribal volunteers were supported by petrol and grains by the chief minister of the North West Frontier Province, Khan Abdul Qayum Khan. The tribesmen were aggressive people. Prior to independence, British maintained cold relations with them through paying off subsidies to the chiefs. The tribesmen were inhabitants of tribal territories bordering Pakistan and Afghanistan. When Muslim rebels of Poonch saw same weaponry in the hands of Hindus and Sikhs, communal tensions grew. Maharaja, in turn, passed an order to massacre the rebels. This made Sardar Muhammad Ibrahim Khan organise an army of 50,000 against the Maharaja’s army. Even the creation of India and Pakistan on 14-15 August brought no ease to the already chaotic situation. Newspapers were abuzz during partition that make important references to Jammu & Kashmir conflict. Ian Stephens, editor of ‘The Statesman (Calcutta), noted the situation in Jammu: ‘Unlike every part of the State, Hindus and Sikhs slightly outnumbered Muslims, and within a period of about 11 weeks, starting in August, systematic savageries….practically eliminated the entire Muslim element in the population, amounting to 50,000 people. About 200,000 just disappeared, remaining untraceable, having presumably been butchered or dead from epidemic or exposure. The rest fled to West Punjab (Pakistan, 1963, p.200).’ It was also reported on various newsprints that these atrocities had been perpetrated not only by uncontrolled bands of hooligans but also by organised units of Maharaja’s army and the Police. This made political developments difficult to control. Therefore, we come to analyse that Maharaja’s rebellions against no tax campaigns ultimately lead to devastation of many villages and persecution of thousands of his rebelling subjects that concerned the Pakistani Dominion and turned Maharaja’s administration into a frightful situation, seeking external mediation for preservation of his unpopular and crude feudal power. My above statement can be clarified as I quote ‘The Pakistan Times’, that reported on 27th September: ‘the metalling of the road from Jammu to Kathua is also proceeding at top speed. The idea is to keep up some sort of communication between the State and the Indian Union, so that essential supplies and troops could be rushed to Kashmir without having them to transport through Pakistani territory (Bhattacharjea, Wounded Valley, p.177).’ There was also a boat bridge that was being constructed over the Ravi river, which connected many parts of Gurdaspur in Punjab. There were also reports that Kashmir government was constructing an all-weather linking road that connected Kashmir with Jammu via Poonch instead of Banihal road which was not passable in winter. 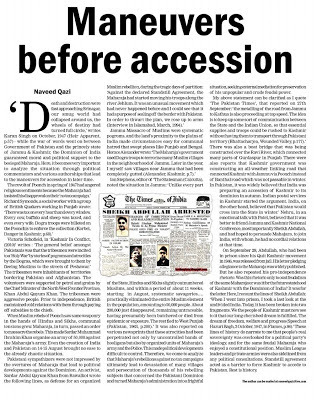 In Pakistan, it was widely believed that India was preparing an accession of Kashmir to its dominion in autumn. Indian postal services in Kashmir started the argument. India, on the other hand, believed that Pakistan would cross into the State in winter.’ Nehru, in an emotional talk with Patel, believed that it was better to friend Jammu and Kashmir National Conference, most importantly Sheikh Abdullah, and had hoped to persuade Mahajara, to join India, with whom, he had no cordial relations at that time. On September 29, Abdullah, who had been in prison since his Quit Kashmir movement in 1946, was released from jail. His letter pledging allegiance to the Maharaja was widely published. But he also repeated his pro-independence rhetoric. Was this rhetoric only to oust feudalism of the same Maharaja or was it for the future statehood of Kashmir with the Dominion of India? It was for the latter. Here, I recount the lines of Sheikh Abdullah: ‘ When I went into prison, I took a last look at the undivided India. Today, it has been broken into two fragments. We the people of Kashmir must now see to it that our long cherished dream is fulfilled. The dream of freedom, welfare and progress (Speech at Hazuri Bagh, 2 October, 1947, in Flames, p.86).’ These lines of history do narrate to me that peoples real sovereignty was overlooked for a political party’s ideology, and for the same feudal Maharaja who enjoyed a constitutional position. Muslim League leaders and private armies were also sidelined from any political consultations. Standstill agreement acted as a barrier to force Kashmir to accede to Pakistan.